Whilst training a public sector customer on AppTracker today we had an interesting moment where the customer asked if they could export the data from AppTracker into Excel. We answered saying yes any grid can be directly exported to Excel, but asked why they wanted to do this. 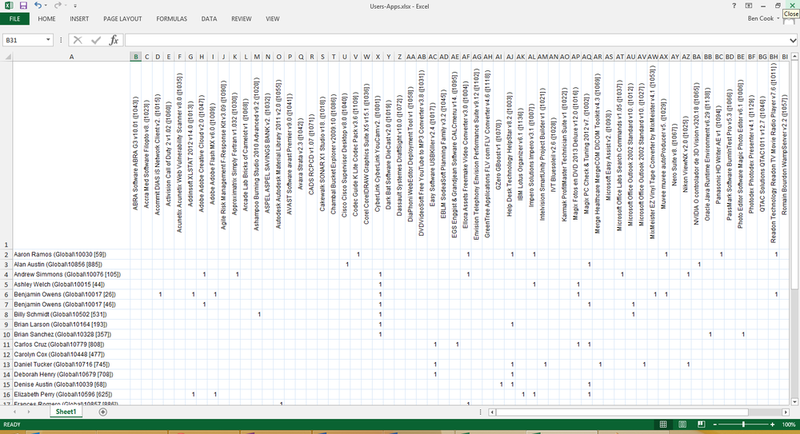 It turned out that this person’s function involved looking at each department’s users, then looking at the applications they require, then building an Excel spreadsheet to capture this information and plan the migration. We showed them that they could produce this exact pivot table in AppTracker, then simply export it to Excel if further manipulation was required. The customer couldn’t believe their eyes – They had spent days manually producing these table up until now. The icing on the cake was when we showed them that they could manually manipulate this data in Excel to fix any errors in the User/App mappings, then re-import this corrected data straight into AppTracker. I've recreated the table using dummy data to show you the sort of data they need. This can be generated in less than a minute. So powerful! Older PostWhats new in AppTracker 4.0?